← A few weeks in my classroom. The day I went into physics class it was death. A short dark man with a high, lisping voice, named Mr Manzi, stood in front of the class in a tight blue suit holding a little wooden ball. He put the ball on a steep grooved slide and let it run down to the bottom. The he started talking about let a equal acceleration and let t equal time and suddenly he was scribbling letters and numbers and equals signs all over the blackboard and my mind went dead. … Well, I studied those formulas, I went to class and watched balls roll down slides and listened to bells ring and by the end of the semester most of the other girls had failed and I had a straight A. … I may have made a straight A in physics, but I was panic-struck. Physics made me sick the whole time I learned it. Is this a strange one for me to love so much? She isn’t describing it in glowing terms. That’s ok though, the presence of a physics lecture in a great book is enough. The main character is intelligent, female and studies physics. *sirens and claxon noises* *waves feminist flag around* There’s another character who is a physics major. The fact that these women study and are good at physics (even if they aren’t all enjoying it) is not even a main plot point. It’s incidental. It’s just normal that that these intelligent women study physics. I hope to accidentally find more physics in great novels I read in the future. I’ve set myself a challenge this half term to read at least one novel, and a popular sience book. Two things I don’t get time to do enough. Three cheers for great reading moments! 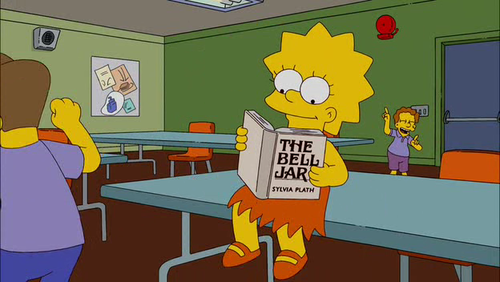 Image | This entry was posted in books, General and tagged accidental discoveries in books, feminism, half term reading, literature, Physics, physics is death, reading, sylvia plath, the bell jar. Bookmark the permalink. Great post. I have a similar rolling challenge regarding reading. I only managed half this half term (1 maths book, no novel). No, it’s a book I read and loved when I was a teenager: Infinity and the Mind – Rudy Rucker. Reblogged this on BE EXACTLY WHO YOU WANT TO BE.